Congratulations to Ryoichi Tamada for taking down Grand Prix Manila! 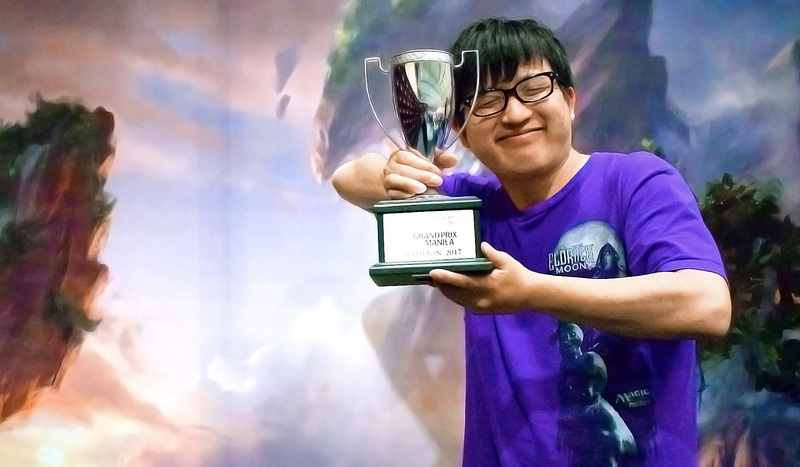 757 players attended Grand Prix Manila to compete in Standard Constructed and when the dust settled, it was six-time Grand Prix Top 8 competitor and Pro Tour Battle for Zendikar finalist Ryoichi Tamada who took it down. This was a follow-up to his hot streak in Kobe last weekend, where he cracked the Top 8 but failed to secure his first piece of gold! Piloting White-Blue Flash, he steamrolled through the Swiss rounds seemingly-effortlessly, before dispatching Rei Anthony Coo in the quarterfinals, Wee Pang Ming in the semifinals, and then Qi Wentao in the finals. This was a bittersweet moment for Qi, the Grand Prix Shizuoka 2017 finalist, but he could't be too upset coming in second in two Grand Prix within the same season. Both players correctly identified Spell Queller as a well-positioned card in the current metagame and were handsomely rewarded. Rounding off the Top 8 were semifinalist Imman Van Valerio, as well as quarterfinalists Dunstan Tauli, and Mark Anthony Biala, all local heroes in their own right! Despite not being able to defend the title, the Philippines should be really proud to put a total of five players in the Top 8! Ultimately, Tamada and his Spell Quellers could not be stopped! Congratulations to Ryoichi Tamada for winning his first Grand Prix title here in Manila! 757 players attended Grand Prix Manila, but after nine rounds of competition only 233 will return for Day 2! Three players - namely Ryoichi Tamada, Mark Anthony Biala, and Matias Monico Palu-Ay – finished 9-0 and were well-poised to make the Top 8 tomorrow. Close behind were (11) Ken Yukuhiro, Toru Inoue, Wee Pang Ming along with 19 other players, all with 8-1 records. In addition, Yuuki Ichikawa, Soh Weng Heng, Zax Ozaki, Au Yong Wai Kin, Mark Lawrence Tubola, Jan Ang, Tomoharu Saito, and Jake Hart all made the cut and remained in Top 8 contention. Despite initial fears that Aetherworks Marvel was going to suffocate the metagame, only around 22% of the field showed up with the legendary artifact. Approximately 15% were Vehicles variants, 15% Black-Green variants, 10% Zombies variants, and 10% Torrential Gearhulk variants, indicating that the metagame was more balanced than what was perceived! As we shut the doors here at the SMX Convention Center, the action is still going on at Grand Prix Omaha and Grand Prix Amsterdam! What surprises await us this weekend? Only time will tell! The hashtag for Grand Prix Manila is #GPManila. Join the conversation!